Kenneth Strange graduated from Thunderbird in 1987. He has served the FBI as a member of the Joint Terrorism Task Force in Newark, New Jersey and as Special Agent in Charge of the Department of Justice Office of Inspector General in Los Angeles. He is presently the vice president of business development for an international investigative services company. The following article originally appeared on March 9th in thehill.com. We have reprinted it here in order to showcase the work of our alumni. Just over three weeks have passed since the tragic shooting deaths of 17 students (14 injured) and faculty members in Parkland, Florida. The event inspired the country to reflect on what needs to be done to protect our teachers and students on school campuses across the country. To that end, there are some facts we should all bear in mind. First of all, the tragedy was perpetrated by one individual. His name is Nikolas Cruz. He is the one who purchased the weapons. 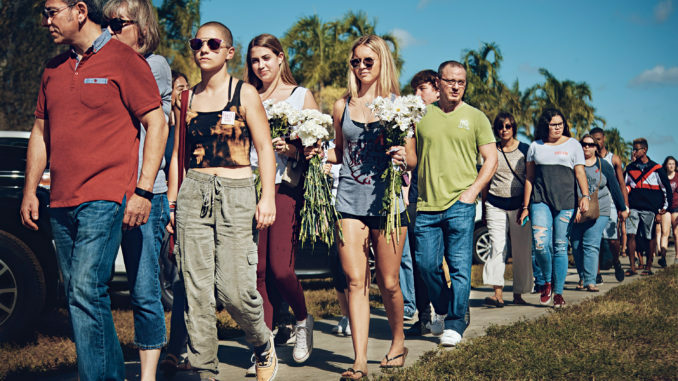 He is the one who showed up at Marjory Stoneman Douglas High School. He is the one who pulled the fire alarm to draw the students into his cauldron of death. He is the one who murdered 17 people and injured 14 others. Broward County Sheriff’s Department didn’t kill these people. The FBI didn’t kill these people. Neither did the NRA, the school district or President Trump. Give credit to where credit is due — to 19-year-old Nikolas Cruz. On that note, a teenager should not be able to purchase an AR-15 assault weapon. Scientific studies have shown that the adult brain is not fully developed until a person is about 25-years-old. It is encouraging to see that, since this shooting, there is a movement afoot to raise the age to 21 for the purchase of such a weapon. Maybe Cruz would have still found a way to obtain the weapons but the current system made it far too easy to do. Additionally, all too often, the perpetrators of mass killings suffer from mental illness. While the vast majority of those with mental illnesses do not go on to become notorious mass murderers, we cannot ignore the fact that almost all mass murderers are mentally ill. In fact, it is believed that Cruz suffered from depression, autism and attention deficit disorder. And, in the year leading up to the shooting, he was no longer being treated. These people should not have access to weapons—for their own protection (suicide) and for the protection of others. A background check to purchase weapons should include questions about mental illness. If a person is being treated for a serious mental illness, that person should not be able to purchase guns. There is little doubt that several systems failed the victims. However, the community did its part. It reported time and time again that a disturbed individual was a clear and present danger to harm others. If this person was visited by law enforcement on more than 20 occasions, why couldn’t they have learned that a weapon(s) was in the house? Further due diligence (especially on social media such as Facebook) by the police may have resulted in a court order to seize such a weapon. I give a failing grade to local law enforcement on this point. Probably the most exigent warning took place a month before the shooting. A person called the FBI to warn that Cruz was unraveling and posed an immediate threat to the school. Unfortunately, the message apparently sat on the Hotline queue in West Virginia instead of making its way back to Florida and the FBI Field Office in Miami. Had the message reached the “Bureau,” the agents may have been able to connect the dots to an earlier complaint about Cruz that was made in Mississippi. When I was with the FBI, these calls went to a duty agent who was trained to assess such warnings. What FBI agent would not act on such a threat from a live tipster? I give a failing grade to my former employer — the FBI. There’s another serious issue as well. How does a former student with a bag of weapons manage to make his way onto the school grounds, enter the school, pull a fire alarm and precipitate mass murder? Unfortunately, in this era, one-way ingress and egress is called for. Cruz would have been stopped at a perimeter security checkpoint (outside the campus), identified and his intentions made known. The school would have already posted a warning that Cruz had been expelled and was not to be allowed into the school. Perhaps an astute guard would have been able to “read” Cruz’s demeanor and contact the police. Maybe Cruz would have shot his way in. Maybe he would have fired on students outside the school grounds. At least the students would not have been trapped in the buildings. A failing grade goes to the school for a lack of security. Though the shooting is still under investigation, it is disheartening to see or hear that law enforcement officers “staged” outside the buildings while the shooting was in progress. Law enforcement officers are trained to go forward (armed and protected) and attempt to neutralize the threat. It appears this did not happen. Some of the first responders are saying that they were commanded to “stage” first. Is that their department’s protocol? If so, don’t blame the officers for following their policy. Blame the policy and those who created it. If that is not the case, then it is on the officers for not intervening sooner. Some of those students may have been saved. However, I will not give local law enforcement a grade until we can determine the facts. Finally, let’s return to the shooter. This individual was described as “broken” and a “monster.” Nikolas Cruz did not have a normal family life and the only person who had kept him together toward the end, his mother, had recently passed away. This was undoubtedly an event, a “trigger,” which hastened his denouement and led to that fateful day. Had Cruz grown up in a loving, nurturing environment, things may have been different. Did his parents spend quality time with their son? Did they read him stories at bedtime? Did they love him unconditionally but discipline him when necessary? If he showed signs of mental illness, did they attempt to help their son? Did the community attempt to assist him? Did his classmates empathize with him? This is where it all starts — at the family and community levels. For this, I have to give society a failing grade.